How do intimidate and fear interact on the same creature? 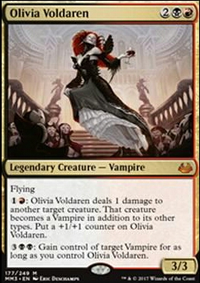 When Crossway Vampire enters the battlefield, target creature can't block this turn. In this game, there are some cards that players find to be either hilarious or suggestive, even if WotC did not intend for them to be so, so I wish to create a thread to honor such cards. The first card that I shall mention is the classic Uktabi Orangutan, notable for its artwork, which one could dismiss as being unintentional if it were not for the flavor text of the card, and the fact that the artist's last name is "Fricker" adds further unintentional hilarity to it, as well. Uktabi Kong does not qualify for this thread, because it was intentionally hilarious and suggestive, as it is referencing and parodying the orangutan. 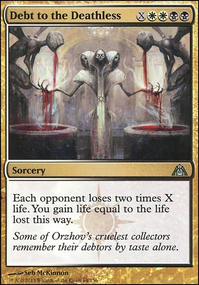 Next is Clergy en-Vec, which again has artwork that could be dismissed as harmless and innocent, but has flavor text that makes it clear that WotC was sneaking an adult joke past the censors. There is also Stonecloaker, in which the titular creature is touching the human in a manner than is very suggestive. Bone Flute is entirely self-explanatory. 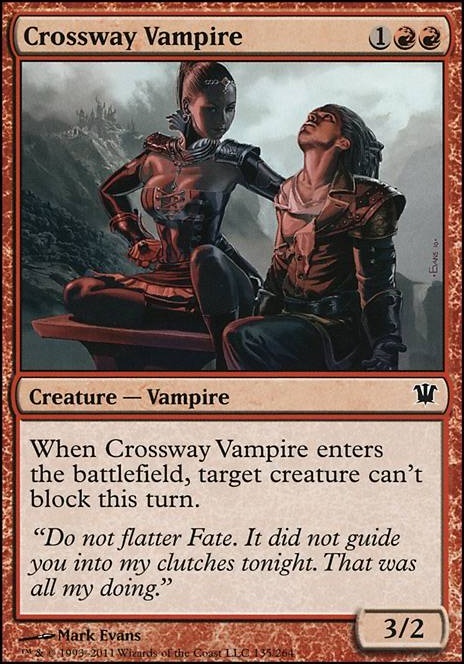 The artwork for Crossway Vampire is supposed to convey a sense of danger and dread, but I cannot help but feel that the vampire in the artwork is about to prey on the human in an entirely different manner than drinking his blood. I am not certain if Earthbind qualifies for this thread, as it is almost certainly suggestive deliberately. What does everyone else say about this? What cards do you find to be unintentionally hilarious or suggestive? With the abundance of R vamps spoiled in SOI and EMN, I decided to dust off my INN/DA/AVR bunch of cards for (casual) Modern play. The most "competitive" scene I'll prolly go to would be the local FNM environment and I don't have any plans getting top tier Red pieces like Goblin Guide and Vexing devil. NOTE: I know Goldnight Castigator is no vamp but a 4cc haste fatty hitting for 4 that can't be bolted is too much to pass up! 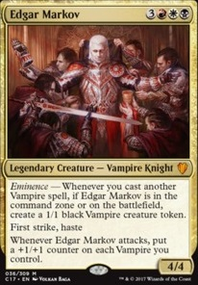 The original plan I had was to go heavy on R vampires and seal the deal with Vampiric fury. Then I thought that maybe a safer approach (aka, can manage to "survive" an early fatty ie: Ulamog) to have 7 - 11 "cannot block" effects via crossway vamp, goblin heelcutter plus sparkmage's gambit and/or hammerhand to keep the . 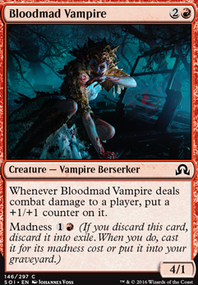 Another line of thought is to (ab)use the Madness mechanic re-introduced. Let's say A has a Bladetusk Boar enchanted with Fear. 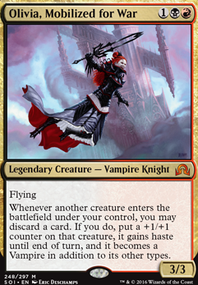 A attacks B, who has Child of Night, Stromkirk Captain, and Crossway Vampire able to block. 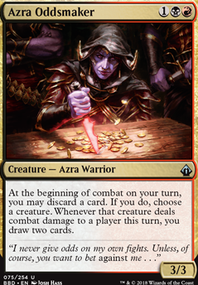 Since the Boar essentially reads, "This creature can't be blocked except by red creatures or artifact creatures. This creature can't be blocked except by black creatures or artifact creatures. ", which of B's creatures could block it? In a different situation, A has Sunhome Enforcer nattily sporting an Executioner's Hood and enchanted with Fear. B has Mardu Roughrider, Spike Jester, Weapons Trainer, and Reassembling Skeleton. If A attacks, which of B's creatures could block?